Any changes you make to your home require some decision making, which can be exhausting and tedious, especially if you have a tough time nailing down what it is you’re looking for. 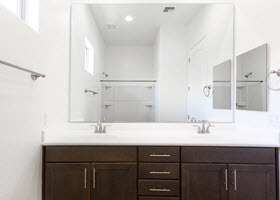 This can be especially true of bathroom remodels, but let’s break it down even further; choosing a cabinet or vanity for your bathroom alone can be a huge task, involving many different decisions within. 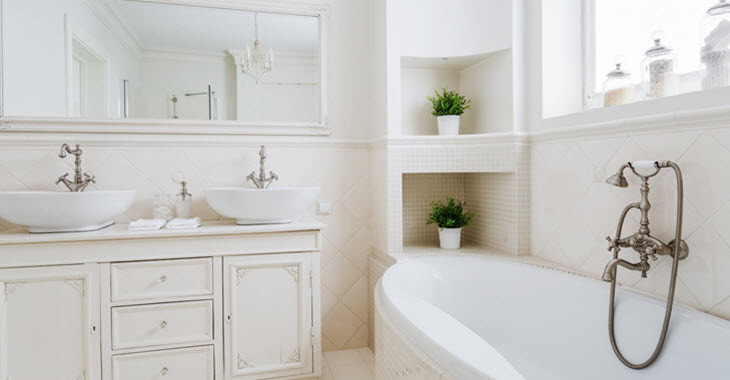 In this article, we’ll take some time discussing why it’s important to put careful thought into your bathroom cabinetry, as well as provide you with some tips for buying the right cabinets for your bathroom. The task might seem small, but there are a lot of factors to consider. So let’s get started. Like we said, it’s important to put some forethought into your bathroom design choices, because in a few years you won’t want to have to go through the process of finding another cabinet all over again. Chances are, you want your bathroom to look nice, but you also want something that is well made. This not only adds to the style of the bathroom, including details in design, but it also adds to the durability of the furniture piece. As we said before, the bathroom can be a tumultuous environment for certain furniture pieces – particularly wood pieces if they aren’t designed, manufactured, or treated properly. Your bathroom cabinets should be able to withstand consistent, somewhat excessive amounts of moisture and water. Not all bathroom cabinet designs are user-friendly for children who may not be able to reach certain areas, or for older individuals who may not be able to bend down too far. It’s important to consider how well the cabinets will work for everyone who lives in your house; in other words, how functional will they be? Additionally, the more people who live in your home, the more storage you’ll likely need – just a thought! The cabinet design you choose should flow well with the rest of your design, or should at the very least be something that excites you. Basic might be just fine, and ornate might be more of your deal; whatever the case, choose something you’ll love to see every morning. In any remodel project, budget is what tends to restrict our choices the most; therefore, it’s important to establish a budget right from the beginning, and stick to it as best you can. It will keep your stress at bay and help limit your options. Any remodel project in your home warrants consulting a professional – at the very least to ensure you’re making good long-term decisions for your home and that your money isn’t being poured down the bathroom sink drain. Don’t let our name fool you – the remodeling experts here at Kitchen Emporium have a wide range of construction and remodeling experience in bathrooms as well. For residents of Southern California areas, including: the San Fernando Valley, San Diego, and San Marcos, we dedicate our time and expertise to make sure the job is done properly the first time. To learn more about how we can help you expand your options in bathroom cabinetry, please visit us today.